The first inhabitants of the region were Native Americans who lived along the shores of the Hudson and Mohawk Rivers. The area was referred to as Canastigione, or "corn flats," because the Mohicans and Mohawks grew corn near the Mohawk River plain. During the period of European colonization, Clifton Park shared a similar history with its neighboring town, Halfmoon. In the mid-1600s, European settlers moved north of Albany and Schenectady and established farms and homes in both the Clifton Park and Halfmoon regions. By 1710, people were able to travel across the Mohawk River by using the Dunsbach Ferry. The ferry was operated by Cornelius Claes Vandenbergh, one of the region's earliest settlers. In 1727, a rope ferry was set up along the river by Nicholas Fort. Another early settler was Nicholas Vischer, who built a house near the Mohawk River in 1735. His son, Eldert Vischer opened a rope ferry in 1790, and the area became known as Vischer's Ferry. Another descendent of the Vischer family, Nanning Vischer, was a captain in the American Revolution and was buried at the Nanning Vischer Cemetery in 1813. After the French and Indian War ended in 1763, more settlers began to move to Clifton Park and Halfmoon because of the promising farmland. Of particular note, Alexander Macintosh lived in the area with his family around this time. He was the father of John Macintosh, who became famous for the apple called "Macintosh Red." Alexander Macintosh's tombstone is dated 1807, which is one of the earliest in the cemetery located at the site of the former Grooms Methodist Episcopal Church. 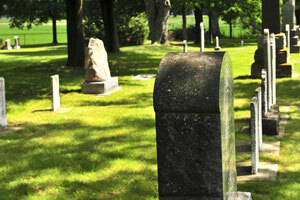 Some people even refer to it as the Macintosh Cemetery. Halfmoon, which was once a part of Albany County, became a "mother" town of Saratoga County in 1791. In 1828, Halfmoon and Clifton Park split apart, and Clifton Park kept the name of the 1708 Clifton Park Land Patent, which was originally granted to early land speculators. Clifton Park held its first town meeting in Grooms Tavern in 1828. Read more about Grooms Tavern and other historic sites below! The Town of Clifton Park continued to grow after its "separation" from the Halfmoon region. Ephraim Stevens, the first Clifton Park town supervisor, operated a hotel at Stevens Corners in the 1820s. The Erie Canal opened in 1825, bolstering commerce and increasing accessibility to the region and the world. 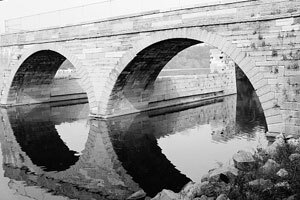 Aqueducts at Crescent in Halfmoon and Rexford in Clifton Park brought the Erie Canal across the Mohawk River, and they extended through 13 miles of Saratoga County. The remnants of the Rexford aqueduct system can be seen today. Until the mid-20th century, Clifton Park was an agricultural town. Early industries in Clifton Park included farming, dairy farms, ice harvesting and apple orchards. There were also saw mills and grist mills all along the Mohawk River. Furthermore, churches of all denominations appeared throughout the area, creating an anchor for families settling in the region. Clifton Park's hamlets featured small, one-room schools. In 1950, the schools were incorporated into the Shenendehowa Central Schools, along with other schools in the surrounding region. Construction of the Adirondack Northway (I-87) in the early 1960s linked Clifton Park to the capital city of Albany as well as other cities and towns along its route, creating an easy commute for residents of this small community. Bridges across the river replaced the canal system as the main transportation corridors. Clifton Park continues to operate as a community for all seasons, welcoming a new, vibrant chapter in its history, offering not only a bustling business environment, but indoor recreation, outdoor fun, apple picking, ice skating, libraries, historic sites, arts, and entertainment! Amity Church was founded in 1802 in Vischer's Ferry. The hamlet's Dutch community initially went across the river to worship in the Niskayuna Dutch Reformed Church. The original Amity Church faced east and was located at the site of the current church. When the hamlet outgrew the original church, in 1871, they replaced it with a larger one that faced south and seated 350 people. Unfortunately, the second church was destroyed by a fire only 16 years later. In 1888, the sanctuary that still stands today was built. The historic Grooms Tavern has undergone multiple changes since it started out as a simple grocery store. Located on the southwest corner of Grooms Road and Sugar Hill Road in Clifton Park, the building was built in 1800 by Seely Blotchily and leased and operated by Albany merchant William Snyder. The grocery store was popular with local families. Over the years, the building's lease changed hands, but in 1828, James Groom was in possession of it, and he had changed it from a grocery store to a tavern. In April of 1828, the Town of Clifton Park was officially formed at Grooms Tavern. Since that first Town Board meeting in 1828, even more meetings occurred annually at Grooms Tavern. James Groom served as town clerk from 1832-1835, and he was town supervisor from 1836-1837. When his son Samuel Groom acquired the tavern, a wagon maker's shop and a blacksmith's shop were added to the property. From the mid-19th century to the mid-20th century, Grooms Tavern was renovated back into a store, but it also remained a popular gathering place and a common choice for Town Board meetings. In December of 1999, Grooms Tavern finally found a permanent owner when the Town of Clifton Park acquired it. Since then, the Town Board has restored the downstairs of the building and preserved it for the future. On April 14, 2007, Grooms Tavern was reopened as an historic & cultural center.